I absolutely love talking 'baby names' - I love hearing the history behind a child's name. Were they named after a family member, a favorite teacher, the city in which they were conceived? So when I read this blog post from my friend Missy ~ it was fun to go back and look at the different trends with our kids' names like she did. After all, our family is complete - I have no reason to right? Harper Josephine - with the middle name being after my dad - Joseph, a grandfather whom she would never meet. Rob wasn't so big on the name Harper the first time around...but when we were expecting baby #2 to be delivered just 15 months after having our first born - Harper Josephine was the name for girl #2. Hailey (the name we chose for baby #1) and Harper - cute right? 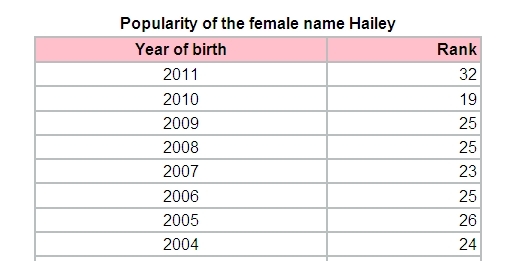 Alas, a second daughter was not to be...and just LOOK at the popularity of that name now! #54 for 2011! I'm still not exactly sure why we decided on Hailey, other than that we both really liked it - but I think once we had settled on her middle name - Elizabeth - named after my husband's mother, (also the name of a dear friend & neighbor) and a traditional, classic name that we both really loved...Then the hunt was on for a name that went nicely with Elizabeth. but, it's a name that fits her and we are glad we picked. For the record, had she been a boy - she would have been named Landon. Just shy of 15 months later, and we delivered our first (and only!) son. We no longer loved the name Landon (weird right?) and had a lot of trouble deciding on a name. And each and every time - he would write back - with JETER on the top of the list. 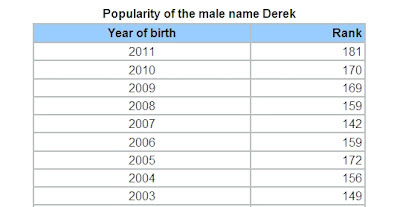 We put Derek on the short list (thank God I was conscious for this delivery, or our son might very well be named Jeter!) and that, is what we decided. I love that it is not very common for kids his age...and still isn't! We struggled a little bit with his middle name. It was very important to me, knowing that this was most likely our only son, that he be named after his dad. 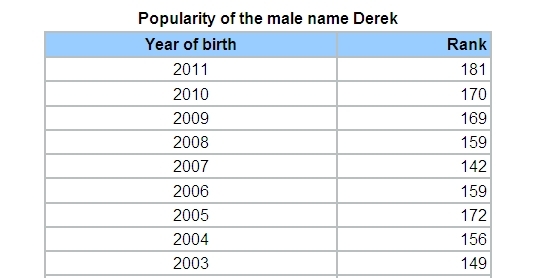 Derek was decided to be a good, strong, somewhat uncommon first name. And Robert - after his Dad. Add in the fact that my husband's family has used the father's first name, for the first born son's middle name for several generations, and it was a pretty easy decision! So, how did you choose YOUR child/pet name? After a special person, place, or thing?